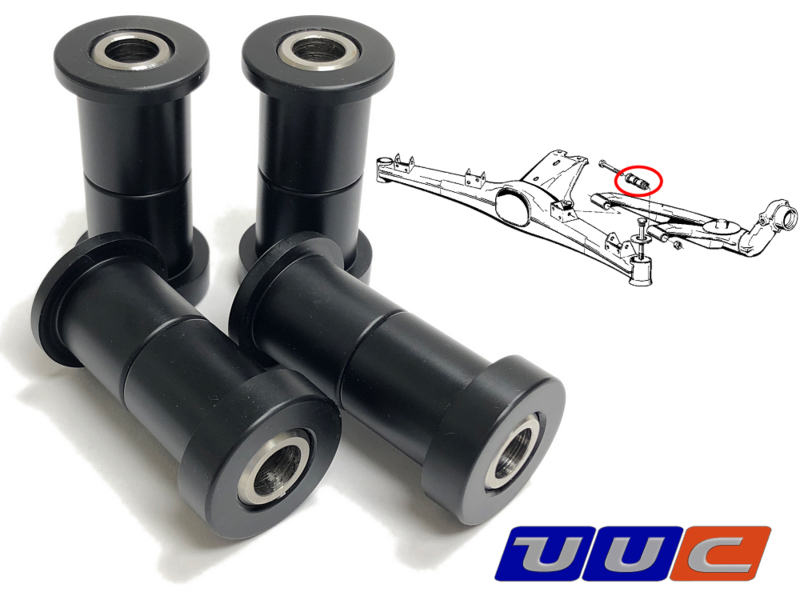 UUC new product announcement: Rear Trailing Arm Bushings for E30, Z3, and other models. 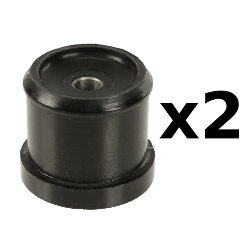 Replacement rear trailing arm bushings for performance street and race use. The net result is racecar functionality with comfortable levels of vibration and noise damping. Delrin bushing material with stainless steel inner tube. 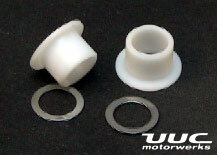 Complete set replaces all four original BMW bushings. [ CLICK HERE ] for more pictures and ordering. Various upgrades are available depending on the chassis and it's specific needs. Please review each part to determine if it is appropriate for your performance goals. Engine mounts: urethane design with cast-in steel mounting points provide strong and flex-free support of the engine and help resist engine movement within the chassis caused by torque application. Urethane design has practically the same level of control as solid “race only” aluminum mounts, but provide vibration absorption similar to OE rubber. Designed for racecars, suitrable for high performance street cars. Many users report no perceived increase of in-cabin vibration, but some amount may be present. LIFETIME WARRANTY with this product. Front control arm bushings use a seperate center section built into a high-durometer bushing material. The net result is racecar functionality with near-OE levels of vibration and noise damping. The OE design of the FCAB is a simple rubber bushing. The part itself is subjected to torsional forces (twisting), lateral forces (side to side), and longitudinal forces (in and out). While this basic rubber design results in a quiet and comfortable ride, it also wears out quickly and has negative effects on performance/enthusiast driving. Specifically, the indicators of worn FCABs are steering wheel shimmy, looseness in the front end, irregular tire wear, sloppy steering response, and suspension geometry changes while cornering. UUC's all-new design incorporates many unique features designed to permanently address these problems while giving the functionality of a race-spec component that also maintains normal street car comfort and vibration absorption. Strengthened inner section accommodates all torsional forces without affecting outer bushing material. Bushing material absorbs noise and vibration. 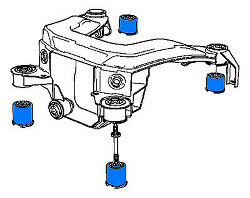 Transmission mounts with optional Enforcer cups: provide same type of support and control for the transmission as engine mounts do for the engine. 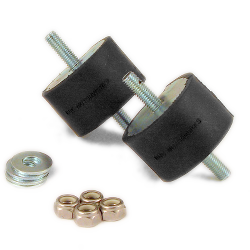 Black rubber transmission mount bushings offer excellent drivetrain motion control. Available with or without transmission mount enforcer cups (combination of bushings and enforcer cups strongly recommended for 6-cylinder applications). Recommended for daily driver cars, and cars that see light track use. 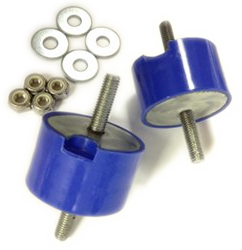 Blue urethane isolated transmission mount bushings which are fully isolated, having two separate mounting bolt hardware pieces embedded in the material just like the black rubber and OE BMW bushings. The urethane is a higher durometer (stiffer) material than the neoprene and offers nearly the same drivetrain motion control as a solid delrin or aluminum mount, but with significant vibration isolation. That last detail makes it a better choice for a track car that is occasionally street-driven, where cabin noise is a concern. While UUC does expect some vibration transmitted into the cabin, initial user reports say that it is minimal and certainly acceptable. Transmission mount enforcer cups can also be used for added effect. 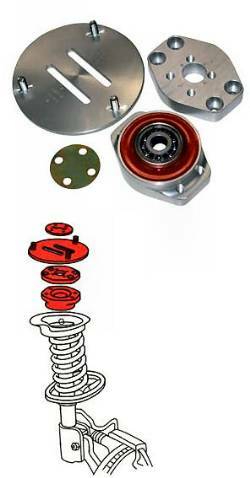 Red urethane bolt-through transmission mount bushings are the strongest choice. A single bolt through the entire piece eliminates any possibility of bushing material failure even under the most abusive conditions. Offers effectively the same drivetrain motion control as a solid delrin or aluminum mount, but with some vibration isolation to reduce vibratory stress on mechanical components. Cabin vibration significantly lower than delrin or aluminum solid mounts, but still noticeable. Transmission mount enforcer cups not required but can be used for added effect. Rear Subframe Mounts virtually eliminate flex and bushing separation from subframe torque forces (especially with high-powered cars). Urethane design assures longevity exceeding OE. Suitable for racing or performance street applications. 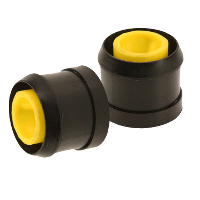 Rear Trailing Arm Bushings: made from aerospace grade urethane and replace the original rubber bushings in the rear trailing arm. Eliminates "bump steer" effect caused by original rubber bushings and results in better rear suspension control, which improves cornering speeds and power delivery. Suitable for street and race use, long-term tested successfully in both environments. Clutch Arm Bushings and Brake Arm Bushings: replace OE clutch pedal bushings that are sloppy, squeaky, and cause clutch or brake pedal to slip to the side. Made of UHMW (Ultra High Molecular Weight polycetal), these bushings permanently get rid of those issues. The great advantage of UHMW over other materials is the superior long-term wear characteristics and self-lubricating properties. Camber/caster adjustment plates engineered utilizing a unique, multi-adjustable design, these adjustable camber plates are an ideal solution. Works with any BMW-compatible front strut or coilover setup designed for original strut mount. Replaces original upper strut mount. Does not change front ride height. Crafted from aircraft quality aluminum, these precision machined adjusters feature OE style bearings and a bonded urethane insulator. The OE style bearing provides proper rotational compliance for the strut shaft and will not loosen or rattle like spherical-bearing designs. 100% urethane isolation prevents noise or vibration transmitted to car's interior unlike solid metal plates. Designed for both performance and racing applications. For original height vehicles or lowered up to 3". 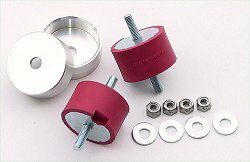 Differential mount bushings (pair): replacement urethane design provides solid mounting of differential, especially important in high-power modified cars and cars that see track or race use. The OE design of the differential bushings is a simple rubber bushing. The part itself is subjected to torsional forces (twisting), lateral forces (side to side), and longitudinal forces (in and out). While this basic rubber design results in a quiet and comfortable ride, it also wears out quickly and has negative effects on performance/enthusiast driving. Specifically, the indicators of worn differential mounts are misalignment of the differential and halfshafts under acceleration and changes in rear toe and camber that can result. UUC's all-new design incorporates a premium quality urethane and steel liner tube for years of trouble-free usage. Will not add vibration to the driving experience. Bushing material absorbs noise and vibration. Urethane suitable for race or street use. Eliminate differential movement or squirm under hard acceleration. Direct replacement for OE bushings.